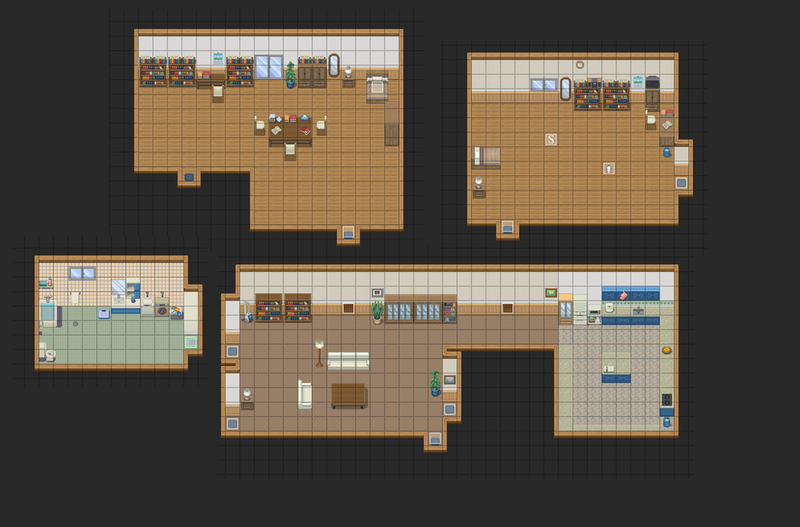 i always did this, i always thought of the room or building and eventually it comes and sticks, then i take it into RPG maker and make the room or building, for example this is the apartment of the main characters of my Series, "Royal"
Nothing wrong with using tools to help visuals the space of a scene depicted in Stories. In fact, back in high school I would use Legos to help me visualize me scenes as my imagination wasn't strong enough to keep the image in mind for long period and eventual forget how'd it look like in the first place. How good is RPG maker by the way? I've been interested in the program, but I've never consider buy it as I don't know much about limits. +1 for sketchup. At times I just use the rendered images as base and draw over it to make it look painted, I always find free to use resources for these tho. A big time saver when you need to draw the same settings over and over again. Why not just copy directly to clip studio? I export solid color and lineart directly to my drawing programs. my friend has RPG maker and he makes really complex stuff. he hasnt ever mentioned that it crashes though. cant hurt to be careful. RPG maker isn't free, but there are free alternatives like Eclipse Origins. If you like legoes then I would recommend Lego Digital Designer. I've used it a few times for these kinds of tasks.